Grazie Italian Restaurant - Upper East Side, NYC. Located just steps from Madison Avenue and one block from the Metropolitan Museum and Central Park, Grazie is the perfect place for lunch, dinner, or a late afternoon snack. 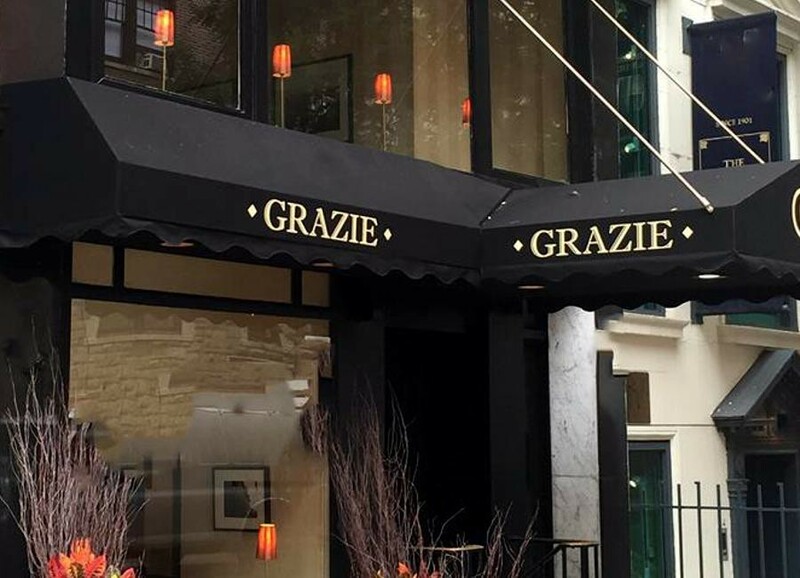 Opened in 1993, Grazie continues to charm the neighborhood with delicious Italian food served in a beautiful townhouse setting. Lunch offers a wide variety of omelets, pizzas, sandwiches and salads. The Italian "Bento Box" offers tastings of two savories and a sweet for a quick, satisfying and inexpensive lunch. At dinner, let us tempt you with wonderful and innovative dishes such as our popular veal, encrusted in aged parmesan cheese and served with a lemon-caper sauce and sauteed spinach. Desserts are not to be missed! Try our Italian s'mores with Nutella and toasted marshmallows or our famous zeppole, rolled in cinnamon and brown sugar and served with two dipping sauces. Sun 10:30am - 10:00pm .